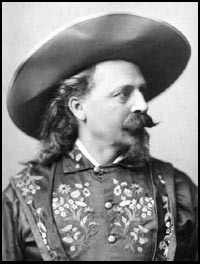 Buffalo Bill Cody was a natty dresser and usually wore a broad-brimmed Stetson, both while performing and in his private life. In 1882, while visiting his home and ranch near North Platte, Nebraska, "Buffalo Bill" Cody organized and put on his first official rodeo type event for the town’s Fourth of July celebration. Though these types of events weren't called rodeos at the time, it was as much the kind of event that would later be known as a rodeo as anything else held in those days. His show was a spectacular one. The day included bronco busting, buffalo and steer roping and riding, and shooting contests. For one of the events four or five head of buffalo were turned loose for the competing cowboys to rope and then ride. Several accounts claim that one of the buffalos was ridden by two men at one time, and another witness reported that some of the cowboys had saddled a buffalo before it was ridden. In spite of the fact that there were no bleachers or hardly any other accommodations for the huge crowd, or any chutes or facilities to handle the livestock, everyone seemed to have a rolicking great time. It was less than a year later, on May 17, 1883, that Bill Cody debuted his first official Wild West show in Omaha, Nebraska. This show not only featured sharp shooting, races, and reenactments, it also strongly featured cowboy skills such as riding and roping. Its debut was a huge success and it was this show, in various forms for a period of 30 years, that would take early, rodeo type events not just all over the American East and West, but abroad to such cities as London, Rome, and Paris.